Love Candy? Love Colors? Decorate your Nook with your favorite sweet treats! 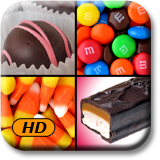 Decorate your device with colorful candy treats! Love Candy? Love Colors? 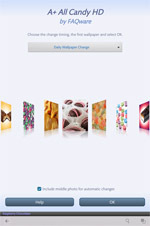 You'll enjoy this assortment of 45 colorful, yummy candies and chocolate confection wallpapers. Indulge yourself with delicious, high quality images of truffles, gummy bears, Peeps, M&M�s, jelly beans, mints, peanut brittle, candy bars, and much more. All are optimized and framed specifically for your device Color/Tablet/HD/HD+. Our A+ apps consistently receive top ratings. These make super fun lock screen and revolving wallpapers with full captions that appear as you scroll through them. Photos change automatically each week, day, hour, or stay on a single photo. Change photos any time with a swipe up or down. This is the healthy way to have all the candy you want. Experience scrumptious candies to die for! 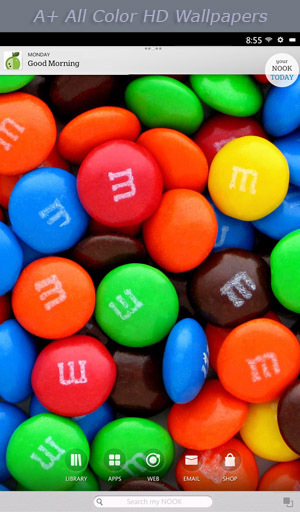 Now tap the A+ All Candy Color choice.